This post is sponsored by YNAB. Teaching you how to budget and how to stick to your budget. 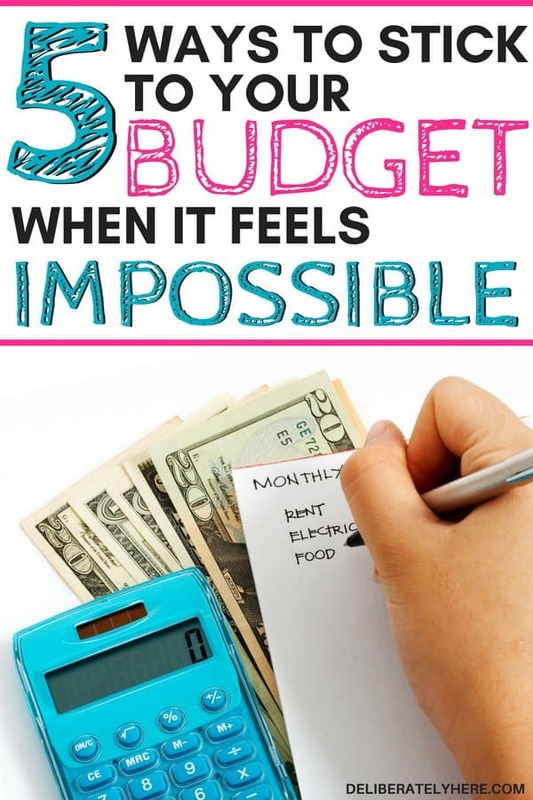 Do you struggle with budgeting? 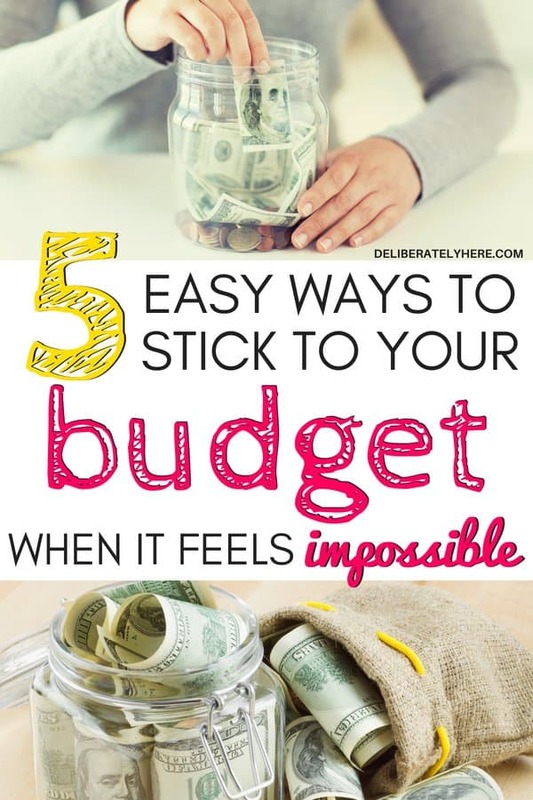 Here are 5 easy ways how to stick to your budget even when budgeting feels impossible. There are budget gurus in the world, and then there are people who are not. Some people can make a budget and stick to it without spending one penny too much every. single. month. and then there are people who have tried budgeting but failed miserably, who have no idea where to start with budgeting, and people who run in the other direction when they hear the word budget. Which person are you? I can assure you that if you’re someone who is the furthest thing from a budget guru, you’re in good company. Before I decided to commit to budgeting and making it work, I hated the whole idea of budgeting. Sure, I knew my husband and I would be saving loads of money if only we would put in some effort to budget, but I did not want to think about my finances that much. We were doing fine with our finances, or so we thought. I just assumed that since we weren’t spending more than we were making (as far as I could tell – but what did I really know, since I had no idea where all our money was really going), we were in the clear. Since our savings weren’t dropping low, we were doing great. We didn’t have to worry about budgeting – we had this under control. Until one month when I was paying our bills and realized that we had spent more money on groceries that month than our rent. Yep, you read that right. I was only buying groceries for my husband and I, and we were spending more money on food in a month than on our rent. That was the month that I realized we really had no idea where our money was going or what kind of financial state we were in, and if we kept going down this road sooner than we knew it we were going to be in deep, deep debt. That is the month that I realized we NEEDED to get control of our money and we needed a budget. I wish I could say that everything has run smoothly since we decided to start budgeting, but that would be a lie. Unfortunately, our budgeting journey has hit many potholes along the way and a couple wrong turns. 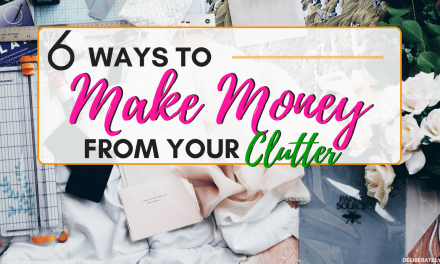 But, each month we’re learning more about our budget and figuring out different ways that we can make our budget work for our situation, and those things are the very things I want to share with you. 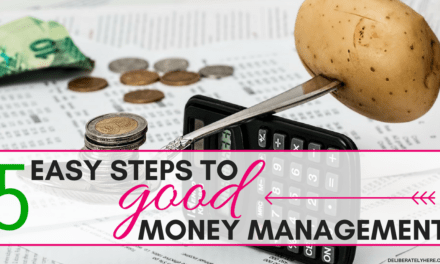 If you’re thinking that you don’t need a budget and since you’re still able to put away a couple dollars every month into savings that you’re in a safe financial place, it’s time for you to really assess your finances and see where your money is going. It’s time for you to make a budget. For me, the hardest part of budgeting has always been sticking to it. 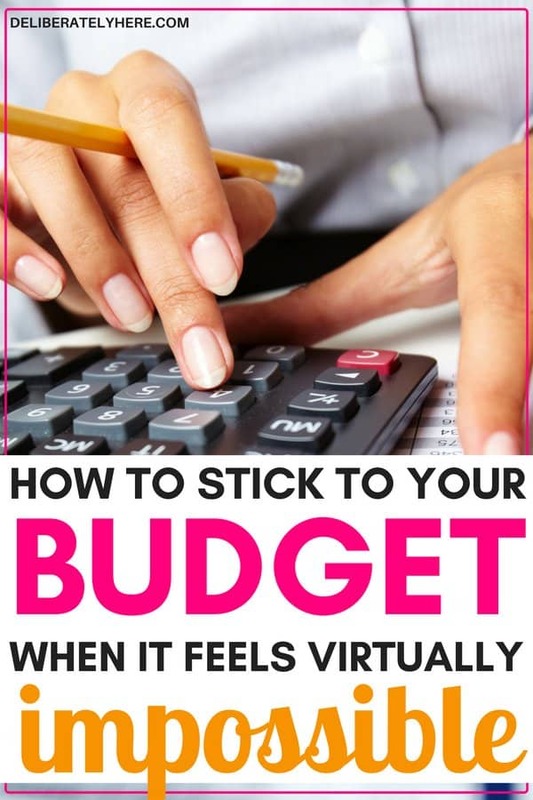 Over my budgeting journey, we’ve learned a few things that have helped us stick to our budget month after month, and I think they could help you learn how to stick to your budget, too. Once you’ve found your why, sticking to a budget will become a whole lot easier for you. Your why is the reason why you’re budgeting. When I first started budgeting I thought this was the silliest step of them all. Why on earth do I need to spend time thinking of why I’m doing this? Obviously, I want to save money. Over time I have learned that the why is, in fact, the most important step of every budgeting journey. You need to have a rock-solid reason for doing what you’re doing, or else as soon as the going gets tough it will be easy to quit. If you have a why, when the going gets tough you simply look back at the reason that you’re doing this and it will give you the motivation you need to keep moving forward with your budget. Creating financial goals is a great way to help you stick to your budget. Creating reachable goals will challenge you to push yourself harder than ever before to achieve that thing you’ve always wanted to do. Your financial goals could be as simple as having an extra $5 to put away in savings after all your monthly bills are paid, or could be as complex as spending 20% less money this month in every budget category you have. The key to successfully creating financial goals for your budget is starting small and working your way up. Don’t make goals that you know you can’t achieve, start with something simple that will challenge you and your finances a little bit, then next month give yourself a bit more of a challenge, and so on. If you create goals that you can’t achieve, it can become discouraging very fast and will shoot down your motivation to budget. YNAB (You Need A Budget) is my number one suggestion to anyone looking for a flexible, thorough and detailed budgeting system. YNAB will help you create your budget, equips you with the exact steps you need to take to gain control over your finances, helps you manage your money, and is very user-friendly. If you go over your budget in one category, you can use YNAB to figure out which other budget categories you can take funds from to cover the category that you went over with. YNAB was started by a newly married couple who needed to figure out a plan for their money, which I totally love, because it shows you that these people have been there and dealt with that. They are real people who have faced real struggles and have found the secret sauce to making their finances work, and they want to share it with the world. If you’re looking for one thing that will help your budget succeed, you shouldn’t hesitate to check out YNAB. And thankfully, if you’re not sure that you want to invest in something right now, YNAB offers a free 34-day trial. So, if you use it and decide it’s not for you, you can simply cancel your membership. If you’re married and/or have children, don’t be afraid to include them all in the budget. Sit them all down and explain to them what your goals are and what changes will need to be made to reach those goals. Show them the numbers on your budget. All too often children are blindsided regarding their families financial situation. I understand that some people may have their reasons why they don’t want to show their children their finances, but if you don’t have any reason not to show them, then you should be including them in the budgeting process. When kids see and get used to how budgets work you are equipping them with good money management skills from a young age. There are several ways that you can include your whole family in the budgeting process. You could have everyone write down a certain financial goal they want to achieve by the end of the month and help them reach their goals, you could challenge everyone in the family to cut one unnecessary cost out of their lives for the next month, and there are many more ways to involve your family in your budget. At the end of the month, sit everyone down again and show them the numbers. Show them how much everyone was able to save by simply challenging themselves in different ways. 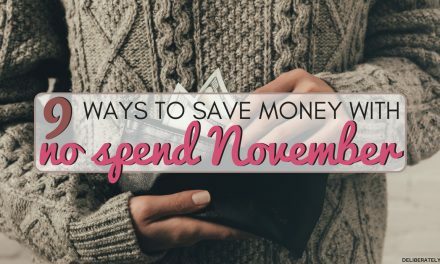 Encourage them to try and save more money the next month, then you can decide where you want to put all the money saved. 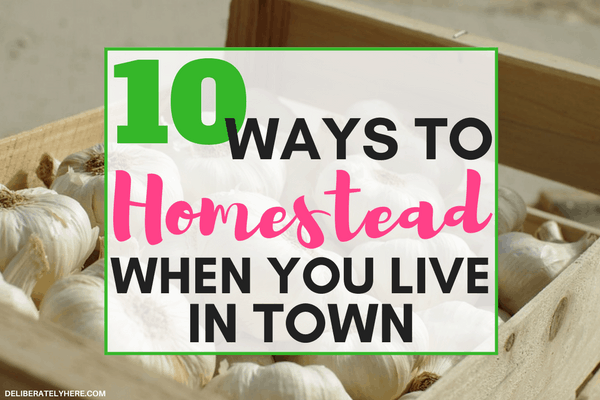 Whether it goes towards paying off debt, taking the family on a vacation, or anything else. Giving your budget time is key to budgeting success. If you give your budget a week then give up because you haven’t seen any extra money being saved, your budget is going to fail. Like all good things in life, budgets need time. You need to be able to stick with your budget for at least a month before expecting to see any changes. 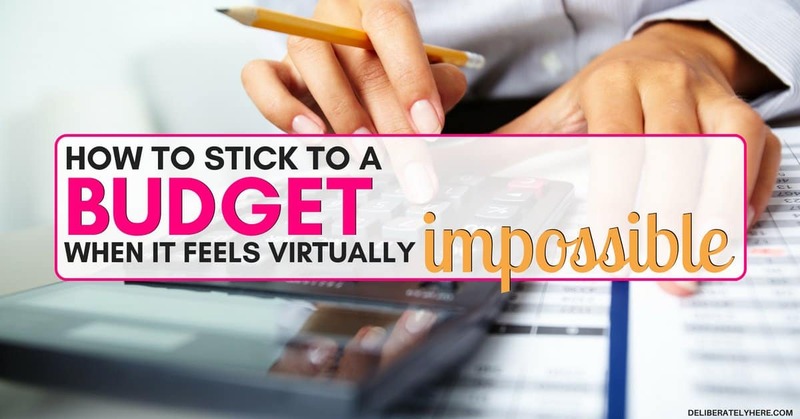 This may be the hardest step of them all, but committing to a budget and deciding to stick with it even when it feels like it is not working with your financial situation is important. Though budgeting may be difficult, it can also help you save your financial situation and set you up for financial success. As the months go on you will realize that you are learning about your finances and your budget better than before, and soon enough budgeting will start to come naturally to you. What are your biggest budgeting struggles? Have you been budgeting for some time now, or are you a brand new budgeter? I’d love to hear from you! This post was sponsored by YNAB (You Need A Budget). All opinions expressed are my own. Providing you with an easy to use budgeting system for everyone looking to get back in control of their finances, YNAB offers a flexible and affordable budget system. Try them for free here.